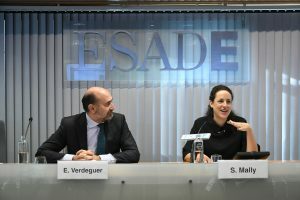 Women’s Economy Europe delivered the keynote speech for the special event which ESADE Business School organized in Madrid on occasion of the International Women’s Day 2018: “Increasing Gender Diversity on Boards of Directors”. Target audience were mainly senior executives and Board Members and Women’s Economy Europe provided latest knowledge and practical advise so to ease the process and obtain more impactful results. The keynote speech was followed by a Roundtable with Marieta Jiménez, President and General Director of Merck Spain; Abel Linares, CEO of Nunkyworld and Board member at Adveo and Catenon; and María Luisa Jordà, independent Board member at Bimbo, Orange Spain and Merlin Properties. Women’s Economy Europe is currently implementing a series of Financial Confidence Courses for women in England through the NatWest Bank “Inspiring Enterprise Programme”. Nine of 10 women will be solely responsible for their finances at some point in their lives, yet research shows they continue to suffer from a surprising lack of confidence when it comes to managing money. Women, sadly, are far less inclined to learn about money and investing, and studies show they are less likely to answer financial literacy questions correctly, according to The Global Financial Literacy Excellence Center. With twice as many men as women start a business in the UK, RBS and NatWest want to change this in order to ease women’s journey towards setting up their own business. The Warwickshire County Council has entrusted Women’s Economy Europe to conduct a feasibility study to develop a kitchen incubator for food entrepreneurs in Warwickshire. The kitchen incubator will represent a great opportunity for many people in the region, especially women food entrepreneurs, who struggle with high costs of adequate equipment and proper permits to run their businesses. Toastmasters International is a world leader in communication and leadership development. It has more than 352,000 members who improve their speaking and leadership skills by attending one of the 16,400 clubs in 141 countries that make up its global network of meeting locations. 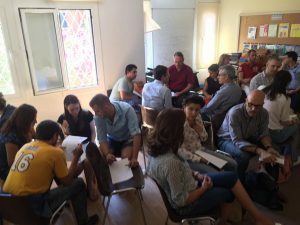 Women’s Economy Europe was invited in July 2017 to implement a workshop about values-based leadership to Toastmasters International officers in Barcelona, during a Club Officer Training Event which was attended by incoming Committee members from several Clubs in Barcelona, Valencia and Mallorca. The workshop’s aim was to help new Club officers to build and foster their Clubs by gaining their members full commitment and by creating an organizational culture all Club members feel identified with while it still takes into account the diversity of its membership basis. In May 2017 Women’s Economy Europe had the pleasure to travel to Anantapur, in India, to provide tailored leadership courses to women at the Vicente Ferrer Foundation (named Rural Development Trust in India). The Foundation is a non-profit which helps to find solutions to the extreme poverty of Anantapur’s rural communities, in the state of Andhra Pradesh, in southern India. Thanks to over 40 years of tireless and constant efforts, the organization has become a deep-rooted part of society, respecting the environment, local culture, and prompting the region’s present-day transformation. The Foundation is especially committed to empower women. The experience was very enriching, not only for the trained women but also for our Women’s Economy Europe trainer. These Indian women of different ages are real examples of strong and inspirational women! The Women Economic Forum (WEF) is a global conference to foster empowering conversations and connections among women committed to foster constructive change in all walks of life. It is an initiative of ALL Ladies League (ALL), the world’s largest All-inclusive international women’s chamber and a global movement for the Welfare, Wealth, and Wellbeing of ALL by empowering women’s leadership. 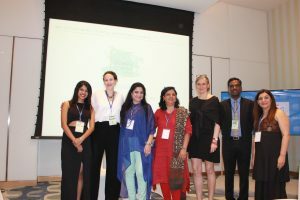 Stella Mally, the Director for Spain of Women’s Economy Europe is member of the Advisory Council of the Women Economic Forum and she was invited to participate in the Forum’s 2017 edition “Creating, Innovating, Understanding and Driving the Future”, which took place in Delhi, India, at the end of May 2017. She had the chance to lead a session about social enterprises run by women as change makers and to speak at one of the plenary sessions of the event. Stella had the honor to receive the award “Iconic women making the world a better place for all” from the hands of Dr. Harbeen Arora, Founder & Global Chairperson of ALL Women’s League.